Observation - Heron testing the ice at paxton Pits - UK and Ireland. Description: This Grey Heron was standing on the ice watching the group of birds swimming in the open water 50 m away. 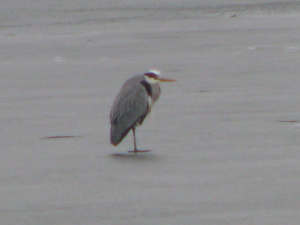 This Grey Heron was standing on the ice watching the group of birds swimming in the open water 50 m away.